Neither the heavy snows nor the holidays have slowed down Montgomery County track athletes this month. MoCo teams especially aren't fooling around in the boys 4x800. Right off the bat the Walter Johnson boys clocked an 8:09 4x800, a rarity in a developmental meet in the month of December. Damascus led for nearly the entire race. Thomas Arias split 1:59 to lead off while WJ's Sean O'leary split 2:00. Devante' Thomas of Damascus split 2:06 while Josh Ellis kept pace with a 2:06 split for WJ. In the third leg, Ben Constantinides of Damascus opened up a slightly bigger gap with a 2:03 split while Nicholas Regan of WJ split 2:04. Martin Dally of WJ sat behind Jon Constantinides for three laps before blowing past him for a 1:59 split and a time of 8:09 overall. Damascus finished in 8:12. 8:09 and 8:12 in December. Wow. In the girls 4x800, WJ girls led for the entire race to win in 10:04. The girls hurdles belonged to Thea LaFond of Kennedy who was about a half second ahead of anyone else with a time of 8.4. The boys hurdles went to Samuel Asiamah of Einstein. He won the first heat with a time of 7.9. Olivia Ekpone and Katie Wolf lined up side-by-side for the first time this season in the 55-meter dash. Ekpone appeared to get off to a great start and ran 6.8 (hand timed) while Wolf came in second in 7.1. Gwen Shaw, the freshman from Wootton, led the rest of the pack with a 7.4. Bisi Ezekoye of Kennedy once again took the top spot in the boys 55-meter dash. He clocked about 6.3 in edging out his opponents. Brian Lucas of Damascus and Devin Haywood of Quince Orchard followed closely from the outside lanes in about 6.4. Next up was Ekpone vs. Wolf - Round 2 - in the girls 300. Ekpone again got the best of Wolf, 40.3 to 40.9. In the boys 300, Rodney Kizito of Springbrook led for most of the race, but Brandon Addison of Watkins Mill charged passed Kizito in the final 25 meters to take the win in 36.2. Alyssa Henshaw of Northwest led the girls 1600 field from start to finish. The pack began to thin out after she came through the 800 in 2:40. Maryam Fikri moved into second and followed Henshaw as several girls began to fall off the pace. Henshaw tried to shake Fikri for the remainder of the race but Fikri stuck right to her heels. Henshaw brought it home in 2:38 for an overall time of 5:18 with Fikri just behind her. Stephanie Joson was third in 5:33. 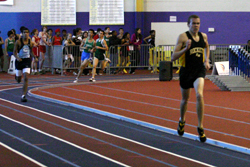 Sam Martin of Richard Montgomery was similarly dominant in the boys 1600. He started out with a 2:19 first 800. Thomas Arias of Damascus moved into the lead, but Martin quickly retook the lead. On the same lap, Jatin Narang of Clarksburg moved into the lead, but again, Martin would not sit in second place for even one second and regained the lead. Martin pushed to the finish for the win in 4:36 while Narang took second in 4:39. Sei Masuoka and Thomas Arias were third and fourth in 4:41. 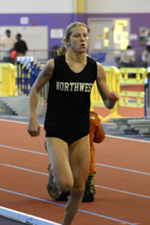 In the girls 500, Britt Eckerstrom of Northwest showcased her speed with a dominating victory in 1:18.1. The next girl was over 5 seconds behind her. If she can repeat that result with automatic timing, she will be in elite company. Only four Montgomery County girls clocked a faster 500 meter time in the last ten years. In the second heat, Udeme Akpaete of Springbrook won in 1:21. 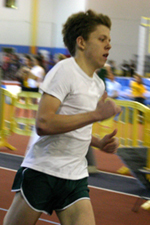 Martin Dally of Walter Johnson won the boys 500 in 1:06.3. His closest opponent finished in 1:10. In the second heat, Jon Constantinides won in 1:08. In the girls 3200, a tight pack of 7 girls stuck together for the first mile in 5:58. Stephanie Joson of Quince Orchard began pushing the pace just before the mile and the pack began spreading out. Alexandra Giedd of Churchill stuck close to Joson for the next three quarters of a mile. With two laps to go, Giedd blasted into the lead and took a two second lead over Joson over the course of one lap. She extended her lead with a strong finish and won in 11:53. Joson was second in 12:02 and Charlotte Bourg of Churchill was third in 12:23. The boys 3200 saw several lead changes. Ishan Dey and Alex Willett settled into the lead after three laps and cruised to a 5:07 first 1600, but Alex Arias of Damascus would not let them settle. Arias pushed into the lead after the ninth lap and pushed the pace. Willett and Dey sat behind Arias for two laps, but it soon became apparent that Arias would not fade away. Arias started to pull away and only Dey could stick with his pace as Willett began to fade with a half mile to go. With just over two laps to go, Dey moved back into the lead and began breaking away from Arias. Arias couldn't match his strong finish. Dey was first in 10:11, Arias was second in 10:14, Conor Spaulding of Quince Orchard was third in 10:21, and Alex Willett and Scott Sheehan took fourth and fifth in 10:22. The Northwest girls dominated the 4x200, although their time of 1:50.6 was not nearly as fast as their other times this year. In third for the team was Olivia Ekpone who secured the win, but anchoring the team was Christine DiNardo who just completed the 3200 race. That's a tough combination of races! 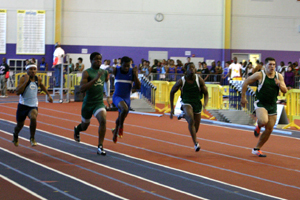 Watkins Mill led from start to finish in the boys 4x200. At the first exchange, Damascus was close to Watkins Mill and then Springbrook moved into second place for the remainder, but it was Watkins Mill who won in a terrific time of 1:33.7. Maryam Fikri of Churchill led the girls 800 race from the start to the finish. She split 70 seconds at the quarter mile and brought it home for the win in 2:23. Springbrook sophomore Udeme Akpaete chased after the veteran Fikri and finished in second in 2:27. In the first developmental meet, Sam Martin ran the 500 and 3200, but in this meet, he ran his bread and butter events, the 800 and 1600, and came away with double victories. He won the 800 the same way that he won the 1600. He got out front early and didn't let anyone get by him. He split 30 seconds at the 200 and about 61 seconds at the quarter. He was challenged by Damascus's Thomas Arias on the third lap but never fully surrendered the lead. He came through the 600 in 1:31 and brought it home in 2:02. Arias finished a step behind him and David Hamilton of Richard Montgomery caught Sam Widmayer of Poolesville at the line in about 2:03. The Northwest girls stacked the 4x400, and after a 61 second 400 split from Britt Eckerstrom, the race was already over. India Knight split about 63 and Alyssa Henshaw split about 65 before Olivia Ekpone split 59 for an overall time of 4:08. Watkins Mill tried to sweep the two sprint relays but came up short with a second place finish in the boys 4x400. Damascus and Watkins Mill were even at the handoff in about 55 seconds, but Damascus opened up a half second lead with a 56 split on the second leg. Watkins Mill's third leg, who I believe was Brandon Addison, the winner of the 300, split 52 seconds to close the gap and open up a half second lead over Damascus. DeVante' Thomas regained the lead for Damascus with a 53 split and an overall time of 3:35. Watkins Mill was second in 3:37. Yeah WM was looking real nice out there. I see you 'Rines! Yea Watkins Mill..I see you Brandon A.!